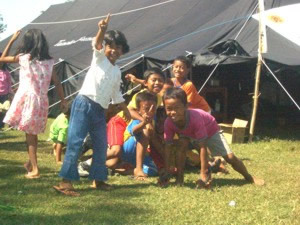 After a month of distributing food, medical supplies and shelter to remote villages worst affected by the earthquake which hit Central Java on 27 May 2006, the Foundation turned its attention to the children. In all the areas visited, schools had collapsed or were too dangerous too enter. 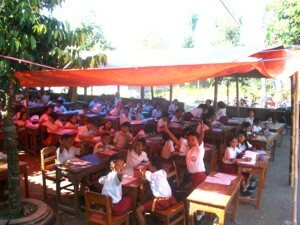 Desks and chairs had been carried out to open areas and the children were trying to continue their studies under makeshift tents. 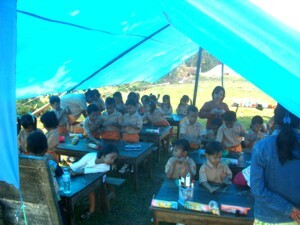 However most of the school books had been destroyed by the rain making this an almost impossible task. 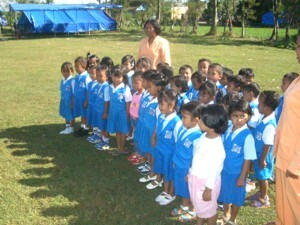 The Foundation began purchasing school books, pens, pencils etc. 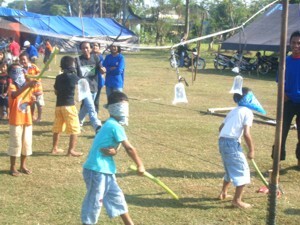 and distributing these to the village school children. By this time the distribution team of volunteers from Yayasan Gunungan and Pratama Mulia University had been joined by members of Gaja Mada University in Yogyakarta, with Pram from Yayasan Gunungan acting as Project Coordinator. 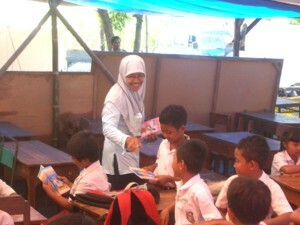 More than 2,000 books as well as school bags, pencils, pens, rulers and other school supplies were delivered to approximately 500 children in 9 village schools across the earthquake hit area of Klaten. 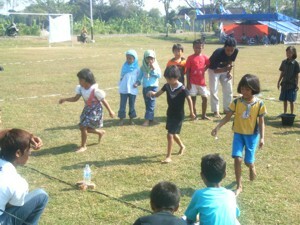 The team moved to the village of Sumber where there was a large playing field. 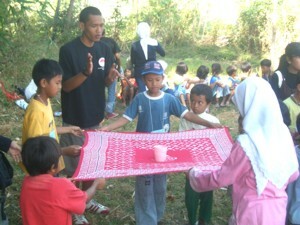 Next was to provide entertainment and activities, and first on the list was making necklaces with children aged 5-6. 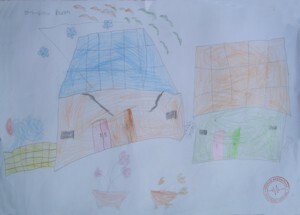 Then they had a drawing competition. 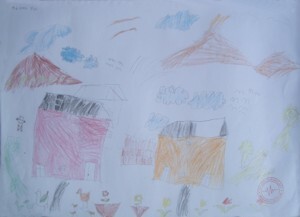 The theme was the Earthquake, to help the children work through some of their trauma. Trained counselors were on hand, although in the end they were not needed. 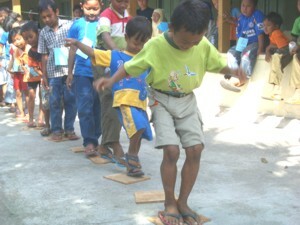 The children really enjoyed the competition and there was a prize giving ceremony the following day. 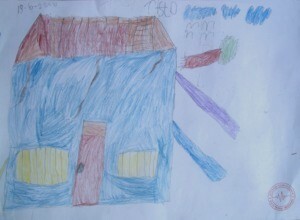 The winning pictures won new school bags and books, with everyone taking part receiving a regular new school bag. 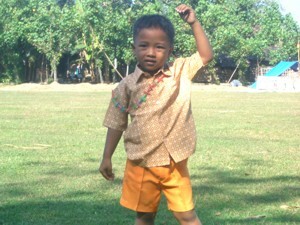 Next was the older children 7-12. 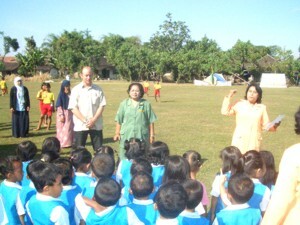 The first day was planned with development activities for over 100 children from the surrounding schools. 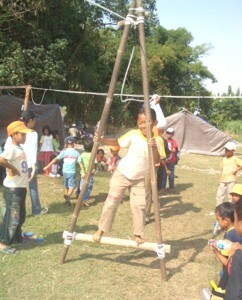 Activities included problem solving and team working games. 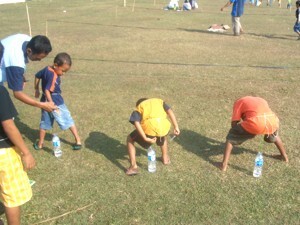 This proved so successful that a second day of activities was added. 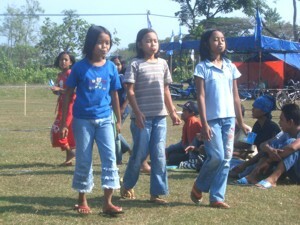 This time with over 250 children taking part. After almost another month working with the village schools and children it was time to look at the next stage of work, the Reconstruction.